I first came across the Betting Assistant while doing some horseracing tips research at the Betting School when following their £900k Plan. The basic premise is to facilitate the placing of bets when trading on Betfair. You are given a 4 weeks free trial of the system and thereafter the cost is £6 per month, which seems reasonable. The main advantage I found was the ability to place bets below the minimum stake of £2. This is ideal if you wish to trial a system or a tipping service especially for lays where the loss liability is greater. However don't expect the software to automatically make you money when trading on Betfair. It's also great for dutching a selection of bets which would not be possible trading on Betfair site itself. My main grouse is with the help files which you can't print out to read away from your pc and I get the report Flash Player 10.1 is not currently available for your 64-bit web browser. It says I can download a version to run on my laptop but you have to jump through all manner of hoops to achieve it and in the end I gave up. The main page that starts off the application is not exactly intuitive either and you have to read a fair bit of the user guide before you can do anything. In my own guide to its use here, I will concentrate on aspects of the trading on Betfair software that I found useful. To cover all its possible uses and facilities would be far too time consuming and most readers will have become bored and left, long before reaching the end of this article. 2. Placing lay bets incorporating conditional bets in running. When you first login with your Betfair login details the system loads the markets for the day. You can then add the markets you are interested in to the Quick Pick List eg All UK Win (Horse Racing) and if you will be using these markets regularly you can set them to load automatically whenever you sign in. At the top left of the page you will see Options - click this and then from the menu Preferences and then Quick Pick List / Markets Finally click the boxes you require. I have ticked the first 4 for UK & Irish win and place (Horse Racing) markets. While the Preferences box is up you can see in the Staking section all the default stakes for every bet you place ie all set to the minimum £2 stake which you can adjust up or down. However with the Betting Assistant you can request stakes for any amount either above or below the default stake. The default for dutch profit is set to £0.50 which means that whatever selections you have chosen to dutch, the profit obtained will be as near £0.50 as possible. I left it at this setting initially until I got a feel for using dutching and it is also possible to change the required profit when placing the bet. Click okay to save your preferences and your markets for trading on Betfair will now be showing in the Quick Pick List. You will notice that the main part of the screen is devoted to the latest reports for trading on Betfair concerning the functioning of the Betfair Exchange. This is to alert users to any potential problems that may affect their bettting. Now click on your race (market) in the Quick Pick List and a grid appears with the runners and their current back and lay prices. the heading Dutch so tick the selections you wish to include in the bet. Above all this are a list of tabs including one titled Dutch Betting click this and a small green window appears with the details eg Dutch Bet £1.32 Profit £0.47. This means that the total stake is £1.32 and the profit if any of the selections goes on to win will be £0.47. To the right of this is a box titled Dutch Profit Required (set as mentioned to £0.50 or as near as possible) Which you can adjust up or down and your stake will be revised accordingly. When you are happy with your bet for trading on Betfair, click the greenDutch Bet window and a further window pops up Place Dutch Bet? and click Yes. 2. 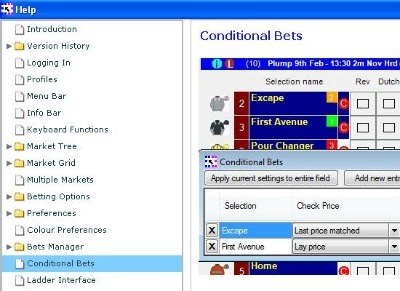 Placing lay bets incorporating conditional bets in running for trading on Betfair. The idea here is to place a normal lay bet and then a conditional back bet on the same selection which will fire in running if your selection turns out to be the likely winner of the race. Thus trading out of the original bet and reducing your loss. To the right of the horse name change the drop down list under Check Priceto Lay price. Under Price change the price to one you consider is safe to assume that the selection will actually win the race. In most cases 1.50 should do it. Under Stake enter the same amount as your lay stake in the price box eg if your lay stake is £1.00 then enter this. I have found this the best option through experience. You won't cover your liability if the horse wins as your profit will be only £0.50 at odds of 1.50 but it does mean that if the back bet is triggered and the horse goes on to lose you will break even. then the bet will be placed at the current price whatever that is at the time. Also my lay bets are always placed to win and not to place when I am using the Conditions facility. This is because the place lay prices are too low to run a conditional bet safely. If the horse loses you gain your lay profit of £1.00 and the conditional back part of the bet is not triggered. If the horse wins the back part is triggered resulting in a return of £0.50 thus reducing your loss. b. The conditional bet stake may not be matched because there is not the liquidity in the market to match the bet. c. The <= price you specified eg 1.50 might not be low enough and triggers a back bet even though the horse does not go on to win the race. Generally however the system works fine especially if you have good lay tips eg my Easy Lay Method selections. NB It is important not to close the market containing a conditional bet or bring up another market on that page as it will only fire if the market remains open. Important To place further bets you will need to open a new market page. Don't forget - as if you create another conditional bet with a new market on the same page you will lose the original one. 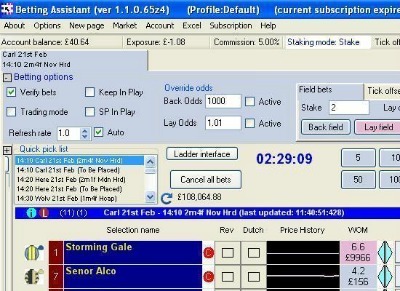 Betfair Betting Assistant for trading on Betfair removes a lot of the time-consuming steps between you making a decision to bet, then your money hitting the market.